Blue Jeans Network Raises $50MM "D" Round - What Does It Mean? Who the Heck is Blue Jeans Network and What do They do? Blue Jeans Network is a provider of cloud-based videoconferencing inter-operability services over the internet.� They specialize in making it easy to connect videoconferencing systems from different vendors and consumer video calling services like Skype and Google Chat. The company was founded in 2009 by Krish Ramakrishnan and Alagu Periyannan who were experts in the virtualization of web services instead of traditional videoconferencing.� The company launched their offering in 2011 and have grown rapidly ever since. What's the Big $98.5M Idea? �3. Ease-of-Use - Blue Jeans simplifies videomeetings (and webconferencing... and conference calls) by offering what is called in the industry a Video Meeting Room (VMR) which can be either a single use "room" or a persistent room assigned to a specific person or team.� Each room owner logs into their room and sends an invite which will include dialing instructions for a variety of end-points: traditional videoconferencing, Skype, Lync, iPads, telephones, or Blue Jeans' own browser-based videoconferencing client. 4. Disenfranchisement of Webconferencing and Conference Calls - Blue Jeans Isn't Just disenfranchising video players... They have the potential to take out audio and webconferencing too!� Video inter-operability is the highest-value conferencing service around and the provider that can provide a low-cost, highly-scalable, easy-to-use platform with lots of bells and whistles is going to win the day... But guess what... Every Blue Jeans account also includes webconferencing and a traditional audio conference call capability for those participants who can only conect via phone.� A Blue Jeans account could easily include an (800) reservationless conference call capability (although it doesn't today) so why should companies have multiple providers and why should users have multiple accounts, passwords, calling cards, etc. 5. 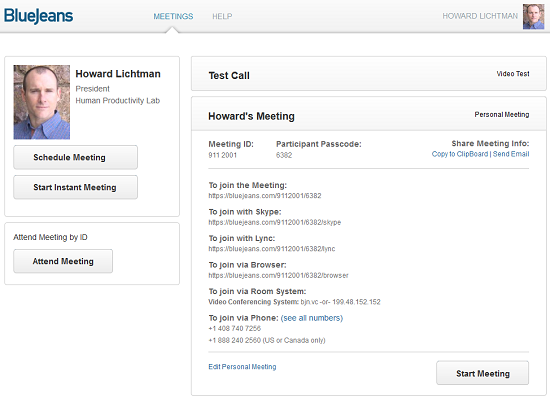 Browser-Based End-Points -Blue Jeans' initial offering, a mere two years ago, was positioned purely as an interop play, a way to connect a remote participant on Skype, to a standard meeting room VC solution. In other words, they marketed their service as an add-on to existing VC environments, making themselves a new partner, rather than a competitor, to the industry mainstays. Their users soon realized, regardless of how Blue Jeans chose to market their solution, it served very well as a primary cloud meeting room, or an alternative to existing MCU based meeting rooms, rather than an addon. In 2012, Blue Jeans responded to those customers now using their service as their primary bridging solution with a new pricing model, designed to flat out compete with the old hardware MCU vendors. Significantly, this opened up vast new markets for the Blue Jeans sales team, who were no longer limited to selling interop as an addon to existing VC users, and could offer affordable, hardware-free video infrastructure to small and medium businesses. �While Blue Jeans was enjoying growth and success with their bridging / interop platform, they could not offer a complete solution to the market without an endpoint of their own . When they did release their own software-based endpoint, they did so as quietly and unpresumptiously as possible. Blue Jeans is a company known in the industry for its aggressive, and sometimes controversial, marketing campaigns, so the fact that their endpoint was released under the radar was interesting. In fact, at first they hardly admitted they had an endpoint, instead referring to it as an "option" for desktop based callers. The browser based-endpoint leverages WebRTC. It does require a plugin, since WebRTC is not yet supported on all major browers, but it is still less obtrusive than downloading and running a separate client on your desktop. What Does the Modern Consumption of Video Services Look Like? 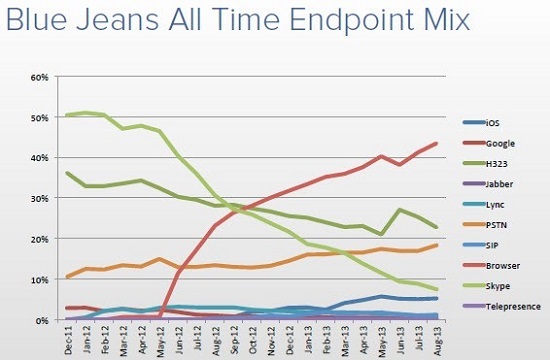 The Blue Jeans browser-based endpoint is so popular, due to its impressive ease of use and accessibility, that it has quickly became the most commonly used method of connecting to Blue Jeans meeting rooms (see the chart above). 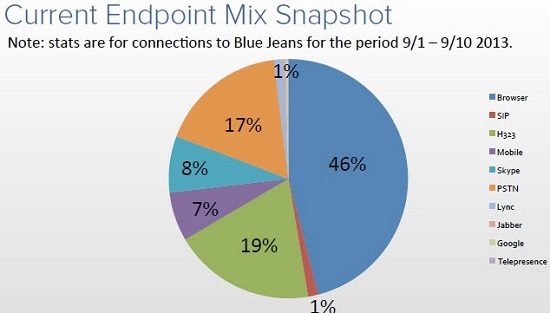 In fact, it appears that the majority of Blue Jeans users who were connecting via Skype are now using the browser-based endpoint. This drastic, and fast, shift to the new Blue Jeans endpoint is outstanding, considering that it was almost completely organic, with no major advertising of the endpoint whatsoever. �This is especially significant because the traditional videoconferencing market has been dominated by hardware-based videoconferencing end-points that have cost north of $3,000.� Now the industry has seen a number of sub-$1000 end-points and low-cost HD pan-tilt-zoom cameras that connect to laptops, desktops, and even the 4" x 4" Intel NUC computer that can be stuck to the back of a display in a conference room.� USB 3.0 with the data throughput to pass HD video from peripherial cameras (PTZ & webcam) to soft-clients, WebRTC clients, and other browser-based clients is opening up the market to mobile users, desk top users, and non-traditional rooms systems running on PCs and laptops. It appears that Blue Jeans is ready to stop playing footsie with the industry and own up to its intention to dominate the world of hosted communications. In a conversation the authors had with Blue Jeans CEO Krish�Ramakrishnan, Krish stated that his new endpoint is "taking the oxygen out of the endpoint market" just as his MCU alternative has been doing no favors to the hardware-based MCU market. �While we still feel there is a compelling need for high quality endpoints in meeting room environments, we must admit to the disruptive potential of every browser on the planet being a free endpoint (via plugin) for any user, or guest, of a Blue Jeans meeting room. Where is Blue Jeans Weak? Whose Boat Just Took on a Little Water? 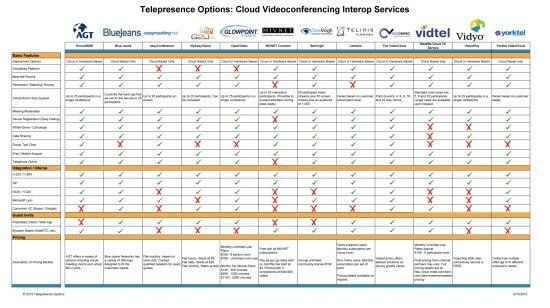 The traditional hardware-based videoconferencing companies (especially Cisco and Polycom).� Big, clumsy, slow, seemingly unable to innovate, unable to retain talent,� and trapped in the classic, textbook "innovator's dilemma" of supporting their traditional hardware-based infrastructure businesses against smaller, nimbler, competitors without the same legacy constraints.� Polycom seems especially, especially vulnerable having lost the majority of their executive team over the last year to scandal and defections. What is the Likely Exit for the Blue Jeans Investors? This is where it gets interesting. �The $50M gives the company plenty of resources to continue to innovate and grab market share but it pushes up the cost of an acquisition considerably. �An IPO down the road is a definite possibility but Blue Jeans is going to have to get some more sales under their belt.� While the company is privately held we estimate their revenue between $10 and $15 million a year well below the usual and customary $50M-100M target for an IPO. A Major Carrier - AT&T, Verizon, BT, Deutsche Telecom, etc. - All of the major telecos have calling card, reservationless conference call, and webconferencing programs for their business customers.� Buying Blue Jeans and adding the capability for any-to-any video meetings is the natural evolution of those services. Microsoft - The company already spent $8.5B for Skype and has, by our estimation, quickly become the largest video managed service provider in the world with their hosted Microsoft Lync / Office 365 program.� The big deficit is that neither of those services is compatible with traditional videoconferencing end-points except through a cloud-based inter-operability provider like... Blue Jeans Network. Avaya, Cisco, Logitech/LifeSize, and Polycom - The traditional videoconferencing players for obvious reasons. Howard Lichtman is the Founder and President of the Human Productivity Lab, a consulting firm that helps organizations design visual collaboration strategies, build Video Network Operation Centers (VNOCs), and helps with RFP creation, bid management, and oversight. He is the publisher of Telepresence Options, the leading publication covering visual collaboration where he and his team share the lessons learned from real world deployments and cover the industry's latest advacements. 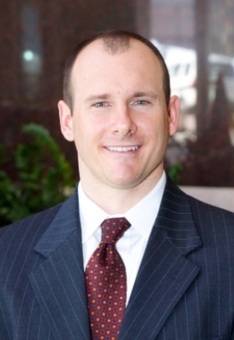 David Maldow, Esq. is a visual collaboration technologist and analyst with the Human Productivity Lab and an associate publisher at Telepresence Options. David has extensive expertise in testing, evaluating, and explaining telepresence and other visual collaboration / rich media solutions. David is focused on providing third-party independent analysis and opinion of these technologies and helping end users better secure their visual collaboration environments. You can follow David on Twitter and Google+. 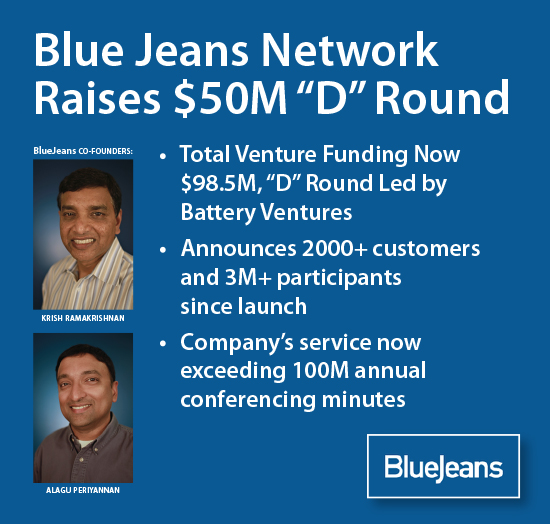 Blue Jeans Network Raises \$50MM \"D\" Round - What Does It Mean? What's the Big \$98.5M Idea? �3. Ease-of-Use - Blue Jeans simplifies videomeetings (and webconferencing... and conference calls) by offering what is called in the industry a Video Meeting Room (VMR) which can be either a single use \"room\" or a persistent room assigned to a specific person or team.� Each room owner logs into their room and sends an invite which will include dialing instructions for a variety of end-points: traditional videoconferencing, Skype, Lync, iPads, telephones, or Blue Jeans' own browser-based videoconferencing client. �While Blue Jeans was enjoying growth and success with their bridging / interop platform, they could not offer a complete solution to the market without an endpoint of their own . When they did release their own software-based endpoint, they did so as quietly and unpresumptiously as possible. Blue Jeans is a company known in the industry for its aggressive, and sometimes controversial, marketing campaigns, so the fact that their endpoint was released under the radar was interesting. In fact, at first they hardly admitted they had an endpoint, instead referring to it as an \"option\" for desktop based callers. The browser based-endpoint leverages WebRTC. It does require a plugin, since WebRTC is not yet supported on all major browers, but it is still less obtrusive than downloading and running a separate client on your desktop. �This is especially significant because the traditional videoconferencing market has been dominated by hardware-based videoconferencing end-points that have cost north of \$3,000.� Now the industry has seen a number of sub-\$1000 end-points and low-cost HD pan-tilt-zoom cameras that connect to laptops, desktops, and even the 4\" x 4\" Intel NUC computer that can be stuck to the back of a display in a conference room.� USB 3.0 with the data throughput to pass HD video from peripherial cameras (PTZ & webcam) to soft-clients, WebRTC clients, and other browser-based clients is opening up the market to mobile users, desk top users, and non-traditional rooms systems running on PCs and laptops. It appears that Blue Jeans is ready to stop playing footsie with the industry and own up to its intention to dominate the world of hosted communications. In a conversation the authors had with Blue Jeans CEO Krish�Ramakrishnan, Krish stated that his new endpoint is \"taking the oxygen out of the endpoint market\" just as his MCU alternative has been doing no favors to the hardware-based MCU market. �While we still feel there is a compelling need for high quality endpoints in meeting room environments, we must admit to the disruptive potential of every browser on the planet being a free endpoint (via plugin) for any user, or guest, of a Blue Jeans meeting room. The traditional hardware-based videoconferencing companies (especially Cisco and Polycom).� Big, clumsy, slow, seemingly unable to innovate, unable to retain talent,� and trapped in the classic, textbook \"innovator's dilemma\" of supporting their traditional hardware-based infrastructure businesses against smaller, nimbler, competitors without the same legacy constraints.� Polycom seems especially, especially vulnerable having lost the majority of their executive team over the last year to scandal and defections. This is where it gets interesting. �The \$50M gives the company plenty of resources to continue to innovate and grab market share but it pushes up the cost of an acquisition considerably. �An IPO down the road is a definite possibility but Blue Jeans is going to have to get some more sales under their belt.� While the company is privately held we estimate their revenue between \$10 and \$15 million a year well below the usual and customary \$50M-100M target for an IPO. Microsoft - The company already spent \$8.5B for Skype and has, by our estimation, quickly become the largest video managed service provider in the world with their hosted Microsoft Lync / Office 365 program.� The big deficit is that neither of those services is compatible with traditional videoconferencing end-points except through a cloud-based inter-operability provider like... Blue Jeans Network.